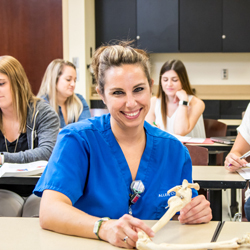 The highly-respected two-year Radiography program at Allen College develops the skills and competencies necessary for entry level radiographer positions. Radiographers use knowledge of science, human anatomy, and physiology to create medical images. Hands-on clinical experiences allow practical application of knowledge. Hospitals, imaging facilities, urgent care clinics, private physicians' offices, and other health care facilities provide employment opportunities. Graduates are fully prepared for a professional career. Successful completion of the Radiography program at Allen College awards an Associate degree. A degree granting program fosters continued education. Credits from a certificate or associates degree in radiography can transfer to a Bachelors degree in Health Science. Graduates earning an associate degree in Radiography may apply to take the American Registry of Radiologic Technologist Certification exam. Eligibility for certification requires that the applicant be of good moral character. Conviction of a misdemeanor or felony may indicate a lack of good moral character for the ARRT purposes. The ARRT conducts a thorough review of all convictions determining eligibility. Documentation for a review includes: a written personal explanation and court records verifying the conviction, the sentence and completion of the sentence. Anything less than complete and total disclosure of any and all convictions will be considered as having provided false or misleading information to the ARRT. This is grounds for permanent denial of eligibility for certification. The ARRT may conduct criminal background searches whenever appropriate. Disciplinary action may be taken at any time upon discovery that disclosure was not complete. Individuals considering enrollment in an educational program, or already enrolled, may submit a pre-application form to have the impact of convictions on eligibility evaluated. Pre-Application Review Forms may be requested from the Department of Regulatory services at the ARRT office.